It’s time for some quick coffee education, and an introduction to two new Reserve offerings: Honduras Premier and Guatemala de Flor. 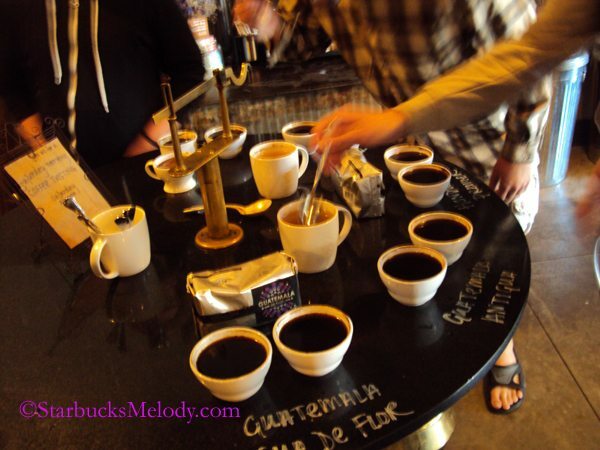 Today (September 3, 2011) I went to a coffee cupping at the Starbucks at 15th Avenue Coffee and Tea. A cupping is the industry standard way to taste coffee and compare nuanced flavors. You may think of it the way you’d learn about any other food: If you compared (side by side) a Red Delicious Apple with a Fuji Apple, you’d surely say they both taste like “apple” but you could also talk about the flavor differences of the two apple varieties. Both of these two new Reserve coffees are washed processed. I really like the flavors in the Honduras. It has some syrupy notes and deep spice notes. One person in our group today described it as a “brown” flavor coffee and thought it was juicy. This is a great offering. I can’t wait to try it on the Clover. The yellow design on the packaging is supposed to be reminiscent of the primary flavor notes: honey. In today’s cupping, we cupped Guatemala Antigua De Flor, the core Starbucks Guatemala coffee (a blend of coffees from all over the Guatemala Antigua growing region), Honduras Premier, Kenya (the core coffee which is a blend of beans from all over Kenya), and the Reserve offering Sumatra Tapanuli. The Sumatra Tapanuli is one of my favorites, and is amazing through the Clover. Anniversary Blend at Starbucks: Looking better than ever before! Melody- I wish there were cuppings around here. I just have never seen them. There used to be more interest in sharing new coffees with samples to customers but they are few and far between. Sharing new items with customers just does not seem to be as prevalent as it once was. Is it a cost factor or lack of interest? @purple1: you should ask your dm. (if you know who that is…or, ask who it is, how to reach her/him etc.) That’s worked for me in the past. Thanx for the ‘tastes’ Melody…..gotta run. Will get back to this later! Denise thanks for the suggestion. I do know the DM, have his email address and have spoken to him on ocassion and have mixed feelings about him. I used to see him more often at my local SB, but have not seen him in a bit, but of course he could be there when I am not. I’m glad to have read and not missed this before tomorrow morning. I walked into the Park Ridge store today and ordered a Decaf Verona at 6am. I must have been too tired to have noticed any new Reserve coffee until I noticed the bags of Honduras on the way out the door. I totally overlooked the Guatemala altogether. I’m glad you discussed this Melody. Since I noticed the Honduras on the way out, I threw a u turn back to the register. I inquired about the Honduras. After reading what you wrote, I can see the barista messed up. She said if I liked Guatemala Antigua, I would like the Honduras. It seems she had it all wrong. I think she had the 2 confused and I didn’t know about the Guatemala until now. My question is to either Melody or Denise. 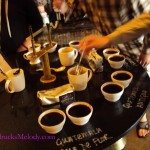 Would you say the Guatemala is medium or bolder than the usual Guatemala Antigua? Melody: How acidic in flavor would you classify the the Honduras? I’m assuming both Guatemala’s would be similarly mellower in acidic flavor. I’m just asking because I’m trying to decide which I would choose to try first. @Chgo and Denise and Purple1 – I have actually already been to two different coffee events for Reserve coffees. A partner at the Olive Way Starbucks did an amazing coffee tasting for these two coffees on Sunday. 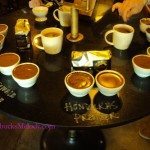 So I cupped them on Saturday the 3rd at 15th Avenue Coffee and Tea, and on Sunday the 4th (at Olive Way) I went to a fabulous coffee tasting comparing and contrasting the two coffees and pairing them with foods. The two coffees are very different flavor profiles, but both are ‘medium’ roast level and body. I really never tasted a strong flavor difference between the core Guat Antigua and the Reserve G.A. but that must be me. The coffee tasting at Olive Way started with smelling a strong lavendar tea to enhance the “floral” notes of the Reserve coffee. Apparently this batch of G.A. reserve has unique lavendar flavor notes and aromas, after the beans were stored at one point on wood pallates with lavendar on them. ?? The design on the Reserve GA is intended to remind you of a lavendar floral. We also tried the Reserve G.A. with a milk chocolate bar. We paired the Honduras with a creamed honey on a sourdough bread. That was amazing. Honey IS the distinctive note of the Honduras. We quickly ran the Honduras through the Clover to try it iced, and it was superb. It lacks some of the brightness of the antiguas – It has its own unique flavor full of bodied, smooth, creamy, brown, and honey-ish. If you want a floral noted coffee to pair with milk chocolate, or sweets, or a lavendar cupcake, try the Reserve. I suspect that the G.A. would pair well with the Tiramasu cakepop too. The core Guat. Antigua is a great coffee too, and close in flavor to the Reserve one, but lacking the floral aromas. I know this is full of typos. I’m trying to rush through this comment. Thanks Mel…. It’s your blog and you can make all the typos you want. Who am I to judge! Great way to explain it! Sounds fun! Like purple1 said, I’v never had a coffee cupping, I also find the 15th Avenue Coffee and Tea concept (where they localize stores) very interesting. Anyways looks like it was a fun time, and maybe some day i’ll visit Seattle and see all the great Starbucks there! 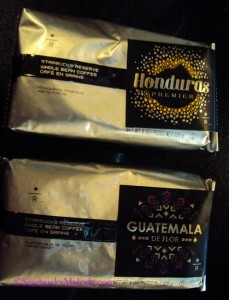 @chgo: I have to say this Guatemala de flor (*Reserve*) is more medium….and nearly the same as the regular Guatem. Antig. to me. Melody gave a great description of it…. 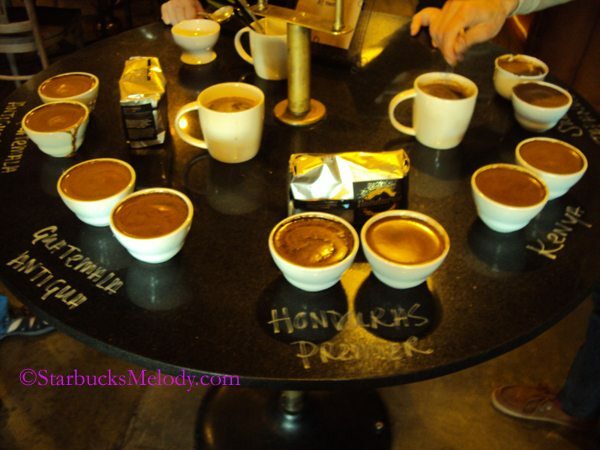 I would go for the Honduras if I were you…..or, get a Clover of either one at Park R. and then decide. Today I went with the Guatemala because: 1) I like the Guatemala Antigua. 2) Because Denise replied an hour and a half after I left the Park Ridge store. LOL! I was somewhat confused and it had nothing to do with the how the Guatemala tasted, but with the prices. 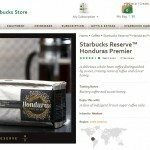 Yesterday, the Honduras was exactly $1 cheaper than today. It was $2.45 for a grande yesterday, and $3.45 today. It was obvious that the it was erased off the chalk board with the Reserve prices (per cup and per 1/2 lb). The handwriting was different where the price was changed. If the price change wasn’t confusing enough, the barista pointed something else out that even had him confused. He questioned why the Honduras was more expensive per tall / grande than the Guatemala, considering the Guatemala cost more per 1/2 lb. In other words, the $1 increase was probably justified for the Guatemala, but the Honduras should cost less than the Guatemala and it was more. I believe a grande Honduras was $3.95. 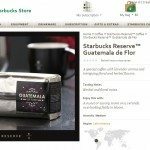 If you order thru Starbucks online, Guatemala is $15 ber 1/2 lb, and Honduras is $14. In store price was $17 for Guatemala and $15 for Honduras. 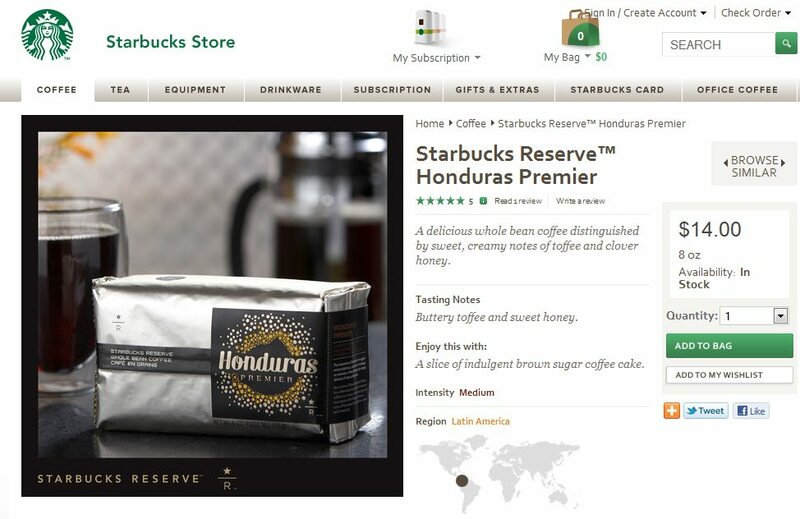 I will try the Honduras, but I would like to know what gives on those prices. @chgo: the prices do go a ittle ‘weird’ sometimes. (besides the rather big 16.7% jump on the bags of beans just recently….couple mnths) I did get a half/pd bag of the Guatemala in Evanston this week for $15./bag. (half pd) An increase to $17. is a big jump in less than a week. I’d say mistakes are going on somewhere…… this does not add up. I had first seen this on TV, about a coffee company. A method used to determine how to improve the taste of the coffee. I find this very interesting. It is great that Starbucks is giving an opportunity for people to experience the method. @ Denise – I didn’t pay attention to the board and the bag price. I was focused on the cup price, The barista told me $17 for Guatemala and $15 for Honduras. Today I looked on the board and saw that it is actually $15 for the Guatemala and $14 for Honduras. It’s no big deal, but I would still expect that the Guatemala would cost more than the Honduras per cup considering Honduras is cheaper, but it isn’t. I tried the Honduras today. I think I liked it, but it seemed okay at first, but got better the more I drank it. Perhaps it was too hot and as it cooled down slightly, I could taste it better. I honestly liked the Guatemala a tad bit better though. On another note…… Did I miss something or sleep through the whole name change for Gold Coast? When did they decide to call it Gold Coast Blend / Morning Joe Edition? Have I been under a rock or what? @Martin – To be totally honest, I wasn’t sure what you were trying to say but I approved the comment anyways. Welcome to the blog! @ Melody – I like the Organic Shade Mexico. I will try it on a Clover. Last weekend, I tried the Starbucks Red on the Clover. Then it dawned on me that I may have actually never had it before. It was great on the Clover and also improved as it cooled down a bit. I have actually read somewhere (possibly here), that somebody suggested coffee at a warm temp., made the coffee more flavorful than at a hotter temp. Although I don’t like iced coffee, I would agree that most coffee taste better warm as opposed to hot. 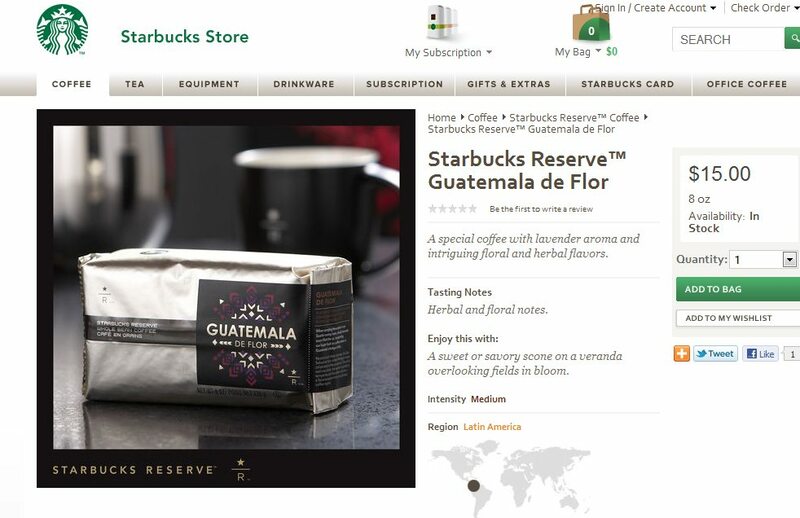 I wasn’t aware the new blends, but ordered the Guatemala de Flor with my Gold reward coupon. It was excellent. Even in the upper 80s weather, I had no complaint whatsoever with a hot drink. I had the del Flor as a treat on my birthday last week (a day early even! We went on the later side while they were working on the retail turn). I found it lovely, but as far as a reserve coffee with cocoa notes, I liked Rwanda better. Haven’t tried Honduras yet. @Chgo – The “Morning Joe” thing happened on 9/6 with the latest retail turn – it’s been that way in grocery stores for ages now, so apparently they just decided to rebrand it entirely. Also, if I remember right, there is a partnership with donorschoose.org in October with Morning Joe. That video was incredibly enlightening! I recently decided to pursue the illustrious black apron, and that is some really cool knowledge to have at the get-go! @kitenarie – Is the game plan to eventually drop Gold Coast entirely from the name? Because it’s currently Gold Coast Blend MORNING JOE. It seems an awfully long name to keep. Since I’m from Chicago, I sure would hate to see them drop Gold Coast from the name, but Morning Joe has a nice ring to it. Would you know if the coffee is exactly the same or if they tinkered with it? and re: the coffee-drinking temps, I agree….too hot is more tasteless. while I do want my morning brewed cup at home HOT……I can’t really tell enough “taste” when a cup is hot in a tasting….or any sample that I’m trying to taste. I had a taste of this yrs Anniversary the other day, which has never been a favorite of mine at all. It was hot, too but even as it cooled, it just fell ‘flat’ for me. plus I’m not crazy about the spiciness…altho I think the past couple yrs it’s a little less spicey tasting. @chgo: just saw your today comment. I don’t see them dropping “Gold Coast”…that is its whole history and why it was named…for the 1st store in Chicago. H.S. even talked about that when I saw him speak this past April…..here, downtown at Columbia College. @Denise – Here’s the new look for the Gold Coast Blend Morning Joe. @Melody – I took your word on trying the Organic Shade Grown Mexico on the Clover today. @Chgo – Maybe I need to write a blog post about Gold Coast Blend. In 2009, when Starbucks partnered with Morning Joe, they started changing the packaging of the coffee in grocery stores didn’t they? I could swear that the new coffee packaging for Gold Coast started showing up in grocery stores now and then like a year to 18 months ago! Maybe it was too expensive to have two sets of packaging for one coffee? I saw the new packaging too in the stores. It looks out of place. I still miss the coffee stamps. The images on the package really need to call up what the coffee is about or the growing region. I have some difficulty thinking that a beautiful whole bean is reminiscent of a tv program. @Chgo (or whomever) – Stock up on Organic Shade Grown Mexico. I’ve heard really loose rumor that it might get pulled from the lineup. I don’t pay much attention to what’s on the shelf at grocery stores as far as coffee goes. That’s probably since I don’t buy coffee anywhere but Starbucks. Of course I will keep an eye out for Intelligentsia at Whole Foods from time to time. That’s probably why I missed this whole Coffee Joe thing. I was starting to enjoy the SB Red on a Clover and it’s day’s if not hour’s are already numbered. It’s so funny. Since I have settled on the Clover for 90% of my coffee purchases, barista’s are confused why I am passing on the decaf when I shouldn’t be. The Clover and the Reserves are becoming an addiction. My wife is even hooked. She loves the Papau New Guinea and the Guatemala. @Chgo – It’s still the same beans, just with the new name. We brewed through all the old bags before the switch on the sixth. It even still says “Gold Coast Blend” on the package, just not as prominently as “Morning Joe.” It’s one of my favorites, so I would be terribly disappointed if it were to go.